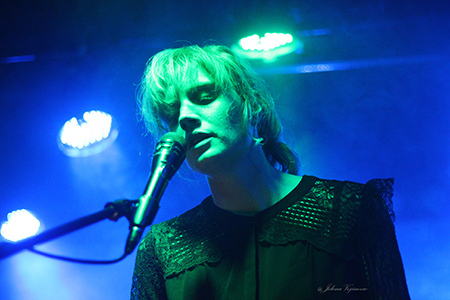 Barbara Lehnhoff aka Camilla Sparksss aka the female force in the post punk trio Peter Kernel. This years MENT festival in Ljubljana hosted both of her projects. I just coudn't miss the chance to do an intervju with this cool woman, musician and visual artist. After her soundcheck at the club Channel Zero, we sat down in the lovely hostel Celica next door and had a couple of laughs and a nice chat about her life and her music. And bears. And tambourine bruises. If you want to know more, keep reading. Camilla Sparksss; does that name mean something to you or was it a random choice? I could also ask the same thing Peter Kernel. It seems there is a word game going on here.. It's actually a character name. In the beginning with Peter Kernel, we were called "El Tocco". The issue there was that a lot of promotors would write "El Tocco - salsa" and there's nothing worse than playing rock in front of a salsa audience. So eventually, we decided to change the name. Both Aris and I are visual designers and we play a lot with contrasts and opposites, so 'Peter' is the most common name in english and 'Kernel' is the opposite, it's the center, the nucleous of something. Camilla Sparksss ended up being kind of Peter Kernel's baby sister, born in 2013, and as my solo project a female name was more suitable. We were on tour with a band Wolf Parade and they did a show with their side project 'Sunset Rubdown'. There was the girlfriend of Spencer (Spencer Krug of Wolf Parade, a/n) playing the tambourine and keys and her name was Camilla. She always had this short skirt on and she would play the tambourine super hard on her leg and she had this huge, massive bruise. I watched her every night and couldn't understand how could she keep playing the tambourine on top of that blue bruise. So I like Camilla because it's a very soft flower. And 'spark' is like the opposite so it's the same game like Peter Kernel. The three S's came afterwards because I found out there was actually a Camilla Sparks back in the 60s, doing kind of punk music and so I added an 'S'. But then I thought - geez, Barbara Lehnhoff, my father is German, and 'ss'..that's a little too much. And so I put three S's. Three S's is perfect. And it also gives that kind of 'sssss' sound..it worked out well. I read somewhere, and I quote, 'she built an Austin Healey piece by piece, she grew up with two brown bears'. I'm dying to hear more about this. That was an exaggeration, there weren't two brown bears. There was just one and it was black. Which is different because the brown ones are really dangerous, the black ones are like big dogs. I come from a very small town in the middle of the great lakes so there is a lot of nothing. The mother of the bear was hunted so there was this cub around our house. He ended up coming closer so we started feeding him and then he's starting to come into the house cos it's cold out. We had him in the house for two years. And as for the Austin, my father is like a project guy. He went through different periods and one of which was building an Austin Healey and when we were kids my brother and I were kind of his slaves, helping him build this Austin Healey. 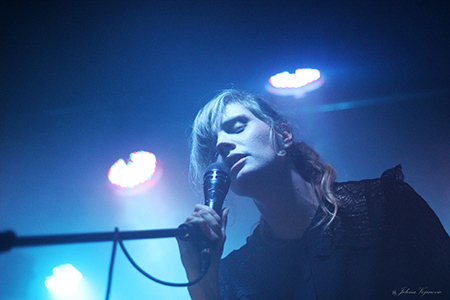 Camilla Sparksss is dark, electronic, pop, but also - and what attracts me the most - has a rock or rather punk vibe to it. What do you feel is the most accurate description of Camilla? It's hard to put a gender on it, it really depends from song to song. I think it's electronic darkwave, post punk. Other than this project, you are also in Peter Kernel together with your ex boyfriend Aris. I understand that Aris is co-composing songs for Camilla Sparksss too. We composed together the first album and as for the second one, he produced it so he's more to the mixing and production side. Both projects were born together, we did everything together, we have a label together, we used to live together. Camilla is really like a female version of Peter Kernel. In October last year you released a brand new single called 'Quasi cool' which is to announce the release of your new album coming in April. This will be your second one, almost five years after your first awesome album 'For you the wild'. You named this one 'Brutal'. So, the last one was Wild, this one is Brutal. I'm already very excited about the third one! But for now, can you tell me what are we to expect from Brutal? Is Brutal the side of Camilla that is more you? The first album is very different from the second one that is comming. Th first is more melodic, more pop because Aris has a more melodic side. The second one is more me, more raw maybe. A bit more edgy, sharp. The title is the perfect description of me, I'm a very extreme person. Things are extremely good and extremely bad, it's hard for me to figure out something in the middle. The word 'brutal' in english is used both in a positive and negative sense. That's why I think it's very good as a title. Is Peter Kernel the reason Camilla Sparksss waited 5 years to make a new album? Yeah, it is. I wanted to release an album two years ago but then we decided to do an orchestral version of Peter Kernel. That took longer then we thought. It took up the space both mentally, emotionally and financially and so we couldn't release two albums at once. We did the orchestra project for a year and it went really well. I think it was really cool for Peter Kernel to do a thing like that cos we've been playing too long in this trio rock version. So, we did this version with harp, cello, viola etc. Aris and I just played percussion and it was a really cool adventure. It also gave us a freshness to open up to other instruments. So that was the reason the album took so long, but it's ok, it's fine. Things keep going and changing and I think is also nice to stay open to something dropping in. Sometimes I just think ok, maybe I'll just do like a metal band, why not. I love the filmmaker side of you just as much as I love the musician. Your videos are so beautifully weird and exciting. You never know what to expect. And they all have this great aesthetic about them. Can you tell me a little about the creative process behind them? I'm originaly a visual artist so even when I compose music is very visual. I already have ideas while I'm writing the songs. Both arts kind of influence one another. Now I would actually like to collaborate with other video artists, I'm getting kind of sick of doing videos. But is very hard for me to collaborate with people because I'm so used to doing that with Aris and we know each others minds. Like for example, the album covers. I usually do all the artwork with Aris and for "Brutal" it's the first time that I called a friend photographer. I knew what I wanted to do but I left it in his hands how to express that and I'm really happy with how it went. For me it's the first album that I'm opening up to other colaborations and that's good I think. Can you tell me something about the alternative music scene in Switzerland? We hear so little about it…It seems just a few Swiss artists manage to break through, like you guys for example. Why is that in your opinion? Actually, I think it's doing really well lately. There's a lot of underground-ish bands. I think the past five or six years there's been a 'boom'. I don't know, maybe they just don't come east. But they tour a lot. I think it's hard to come here, this is also our first time that we played here. Can you name a few swiss bands you like that we should look out for? Puts Marie. And Disco Doom - they are awesome.